Welcome to Glenorchy School. The school is part of the community, working with parents to educate children and we hope you and your child/children will have a good relationship with the school. The staff welcome parents into the school to help in the classroom, with sport and with school trips. Talk with the teachers and see how you can best do this. If at any time you are concerned about your child’s schooling, do not hesitate to get in touch and arrange a time to talk. It would be appreciated if you could talk with teachers either before or after school. Click on the + icon to view information. Children may start school at five years. However, we like all children turning five to spend five mornings at school in the term prior to their birthday. We contact parents of future five year olds and invite them to attend these sessions. Any health or other information which the school should know. On enrolment of a five year old new entrant, a birth certificate must be provided to verify date of birth. A copy will be filed with the child’s record card. Details of any health concerns will be requested for school records. All children are expected to be punctual. Children are not permitted unsupervised at school before 8:30am and after 3:30pm. Eligible bus children are those who live 3.2km from school if under ten years and 4.8km if over ten years of age. If your child is a bus pupil, please let the bus driver, and the school know if they are not travelling home by bus. Bus Driver Contact: Allan Temple/Ingrid Temple: 03 409 0800. Likewise, if your child does not normally travel by bus please let, the bus company and the school know if he or she is to use it. Please let the school know by 1:30pm, as after this time, answer-phone messages are not checked again until after 3pm. Our school uniform is practical, economical and attractive. Students will be required to wear the school uniform when representing our school at any sports events, on camp etc. Uniforms will be handed out to sudents prior to any event and returned back to school ASAP nice and clean. Children should bring lunch from home. No fizzy drinks, lollies or chocolate are allowed at school. Please remember our zero waste policy. Pre-school children and their parents are always welcome at any of our school functions except school camps. School Playgroup comes once a week on a Monday to the Library. The Principal reads a story and they can issue books. In the case of a child becoming sick at school, the child’s parent/caregiver will be advised and the child will remain in the sick bay until the parent/caregiver arrives, or until the child feels better. In case of serious complaint or emergency, the appropriate services will be called. If your child is ill, please do not send them to school until they have recovered. Colds and flus are easily spread in a school environment and we could reduce the impact of these viruses on the whole school if children are kept at home when they are coughing and sneezing. In the case of vomiting and diarrhoea, it is recommended by the Ministry of Health that children are not to be at school for 48 hours. This will prevent a cycle of reinfection getting established. Please let the school know either by phone call, text or via app, before 9.00am, if your child is to be away. Regular attendance is vital to ensure your children’s smooth progress through the school and should the absence be lengthy, a note to the teacher will ensure some work is made available during convalescence. All children are given regular dental checks by dental therapists. Examinations are carried out in Frankton Dental Centre Parents are required to take children to Queenstown for their annual check. Our school is visited regularly by the school health nurse who will discuss any problems with the teachers and look at children referred by the staff or parents. Vision and hearing tests are carried out for children in their first and seventh years. Should a test reveal a need for further attention, the parents are always informed by letter. Outbreaks of lice do occur from time to time and we rely on parents to advise the office as soon as possible. All calls are treated confidentially. A note will be sent home for all parents to check their children’s heads. We rely on parents to assist us to develop in our children the desire to work and play harmoniously and co-operate fully in the life of the school. We use the restorative justice model at school. It aims to resolve matters before they become an issue. If there is a problem the victim and the wrong-doer are asked key questions to help restore the relationship. If you would like more information please ask your child’s teacher or the Principal. If you feel that a problem has developed for your child at school, a prompt approach to the class teacher involved should always be the first course of action. Should you find that the problem cannot be resolved, contact should be made with the principal who will take the action which seems to be the most appropriate in the circumstances. If this is still not to your satisfaction you can put your concerns, in writing, to the BOT chairperson. It will then be investigated by the BOT and a reply given. Regular homework is given to the students (Monday to Thursdays). If you have any concerns please get in touch with your teacher. Homework is given to help students develop routine and self-management skills and to support classroo learning. This is a parent teacher and friends group, which meets occasionally. The meetings are advertised in the newsletter and all parents are welcome to attend. The P.T.F.A. is involved in the running of the school events such as Pet Day, raising money and organizing education- related speakers. . Each year, the school gives the PTFA a wish list and they contribute money towards the purchase of school resources to support the children’s learning as well as contributing towards Ice Skating Lessons, Ski Camp, School Camp, Swimming Lessons etc. Their main fundraiser is Race Day and all hands on deck. The answer phone is on at all times and is checked before school and before home time. You can txt the principal (021 465 127), or contact the school by phone (03 442 9900) or email office@glenorchy.school.nz. Notices are regularly sent home with the children about trips and activities at school. Please check their schoolbags daily. All notices, newsletters, B.O.T minutes and new policies are displayed on the notice board for your information. Physical Education is a part of the school curriculum throughout the year. Different sports are emphasised for different seasons. Swimming is usually December to February/March (weather depending). During the winter Junior children go ice skating, and the Senior children go skiing. Children may wear the same clothes to P.E. as they wear to school but may require more suitable footwear. This programme is designed to enrich the learning needs of the current Year 7 and 8 group and develop independence as children move into higher education. It is modified year-to-year and more specific details of what is required to complete the programme will be shared with the Year 7 and 8 children at the beginning of Term 1. Tracks to Success is mostly home based and a set number of projects must be completed per year. Students have a choice as to what projects they undertake and are encouraged to attempt projects that motivate, inspire, challenge and extend them. All tasks provide an opportunity to develop skills in the Key Competencies,(capabilities for living and lifelong learning).Students use these competencies to live, learn, work and contribute as active members of their community. A cup will be awarded to the child who completes the programme to the highest standard. The Blanket Bay Scholarship is offered to Year 8 students who are leaving to go to a high school. Blanket Bay donated a scholarship which is awarded each year at the final assembly in recognition of academic, sporting, cultural and community service achievement. It is awarded to a Year 8 who has been at Glenorchy School for a minimum of 2 years and who is leaving to further his/her education at a high school. The money is paid directly to the high school that the child is going to attend. The criteria for this scholarship is listed below. A minimum achievement of 70% in the academic section is required in order to qualify for the scholarship. The decision of the principal is final and no dialogue will be entered into. 3. Any standardised test such as TTle. 4. Activity and sporting profile which logs achievements made during the year. ●	Standardised tests/observations/evidence from work. ●	positive attitude to sports and sporting events and demonstrating sports person ship. ●	15% Contribution to the community cultural involvement and all other aspects of school life. Drivers are asked to use the car park on Cantire Street and not the Oban Street grass verge. Children are not allowed to leave school during school hours unless a notice from their parents or caregivers is given to the teacher or the principal. Permission slips need to be returned at least three days before the trip or the child will be unalbe to go. Transport can become difficult to organise, so it would be apprieciated if you could confirm whether you can assist as soon as possible. All camps are compulsory as they are curriculum based and part of the children's learing. If you have difficulty with the cost please contact the principal before the camp is to take place and arrangements can be made. ●	An invoice will be sent to those people who still owe the school money two weeks after the activity was completed. ●	This invoice must be paid by the 20th of the month following the invoice date. ●	If not paid, the debtor shall be subsequently invoiced a maximum of three times. ●	After three unpaid invoices the Principal shall request a meeting with the debtor(s) to discuss the payment options. All children biking to school must wear a helmet. Please make sure your child is aware of rules and safety on the road. It is preferred that children under seven do not cycle to school. Skateboards are not to be ridden in the school grounds between 8:00am and 4:00pm, as it is too dangerous. Wednesdays have been set aside as a ‘small wheels day’ and children may use skateboards, scooters and skates at morning tea and lunch provided they have safety gear. Library books are available for children to borrow. Help your child to ensure books are read and returned in good condition. If your child damaged or lose the book/books issued to them, parents will be invoice for the replacement cost of damaged/lost library resources. A parent survey will be held towards the end of Term 4 to discuss events for the following years. Regular community input will help develop and maintain a relevant Strategic Plan. Parents are encouraged to check the Lost Property Bin. If your child needs prescribed medication during school hours, please get in touch with the teacher, and sign a consent form. Teachers cannot administer medication unless this consent form is signed. The stationery list will be sent out in the week before school starts each year. The school’s Sun-Safe Policy is that all children should wear a sun hat outside for Term 1 and Term 4. If your child does not have a hat on, she/he must stay in the shade or on the decking at breaks. School provides sunscreen in each classroom for your children to use. 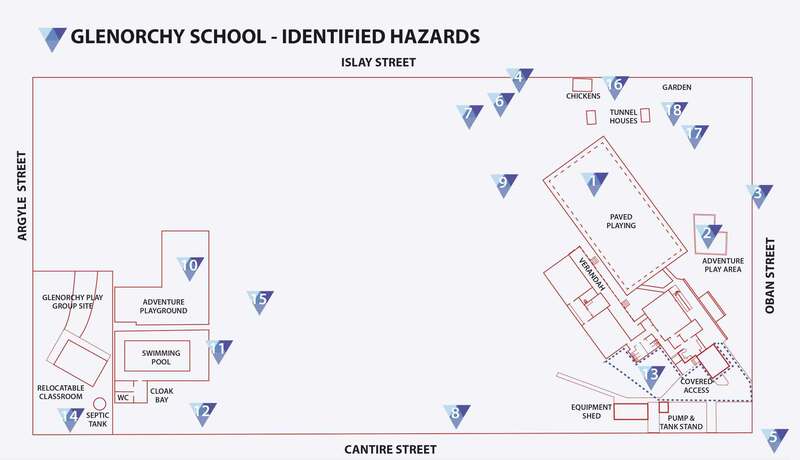 In the event of a major earthquake, the school will assemble and make their way along Oban Street, right into Mull Street and head up Paradise Road towards the Animal Farm. An emergency kit will be kept at school and taken when evacuating. Emergency water and gear will be kept at the Animal Farm. In the event of a fire or earthquake and the buildings have to be evacuated the following procedures must be followed. 1. The signal for the evacuation of buildings because of an emergency will be the continuous ringing of the electric alarm bells. If the power is off the signal will be the continuous ringing of the hand bell. 2. In the event of an earthquake if you are inside a building, move no more than a few steps, then Drop, Cover and Hold. Stay indoors till the shaking stops and you are sure it is safe to exit. In most buildings in New Zealand you are safer if you stay where you are until the shaking stops. 3. All children and adults in the school must leave the buildings by the safest exit. No running, pushing or lingering in corridors or toilets is allowed. 4. If you are outside, move no more than a few steps away from buildings, trees, streetlights, and power lines, then Drop, Cover and Hold. Stay there until the shaking stops. Do not re-enter the buildings. 5. Everyone is to assemble on the paved congrete area in front of the classrooms. 6. The Principal will check his or her assigned area and continue onto the designated assembly area. 7. The class teacher will take the Class Lists to the assembly area and take the roll. 8. The School Secretary/ Principal will take the Absence List and Visitors Log for cross-checking official attendances at school. 9. Teachers call the class roll as quickly as possible. 10. The Principal is immediately informed of roll results and takes actions according to the circumstances. 11. The Principal will inform all teachers and students whether it is safe to return to the buildings or take whatever action is required for the safety of the students. 12. If the Principal is absent the full time teacher will take over responsibility. ●	Listen to your local radio stations, as emergency management officials will be broadcasting the most appropriate advice for your community and situation. ●	Expect to feel aftershocks. ●	Check yourself for injuries and get first aid if necessary. Help others if you can. ●	Be aware that electricity supply could be cut, and fire alarms and sprinkler systems can go off in buildings during an earthquake even if there is no fire. Check for, and extinguish, small fires. ●	If you are in a damaged building, try to get outside and find a safe, open place. Use the stairs, not the elevators. Watch out for fallen power lines or broken gas lines, and stay out of damaged areas. ●	In the event of a school evacuation. Parents/caregivers will be contacted via the phone tree, if possible and children will be collected from the school. ●	If children are unable to be collected or returned home immediately they will remain with a designated care family or the principal’s family. Bus operator to liaise with the outlying families if at all concerned with weather conditions. Bus operator to liaise with Principal to see if the bus run is viable. All families to be informed via the phone tree and will be expected to have their children ready to attend school until a definite closure decision is made. If snow/rain sets in heavily during the day, outlying families/bus operator will liaise with the Principal. If Glenorchy has snow and the teachers cannot travel to school, the bus will not run and we will be closed. School will remain closed until a minimum of one hour after services are connected. If a power cut occurs during the day we will continue as normal unless it becomes a health issue then all the children will be sent home. If we are unable to contact parents via the phone tree the students will be sent to the emergency contact. An injury can be defined as a situation where harm has occurred. An incident can be defined as a situation where harm might have occurred (a near miss). 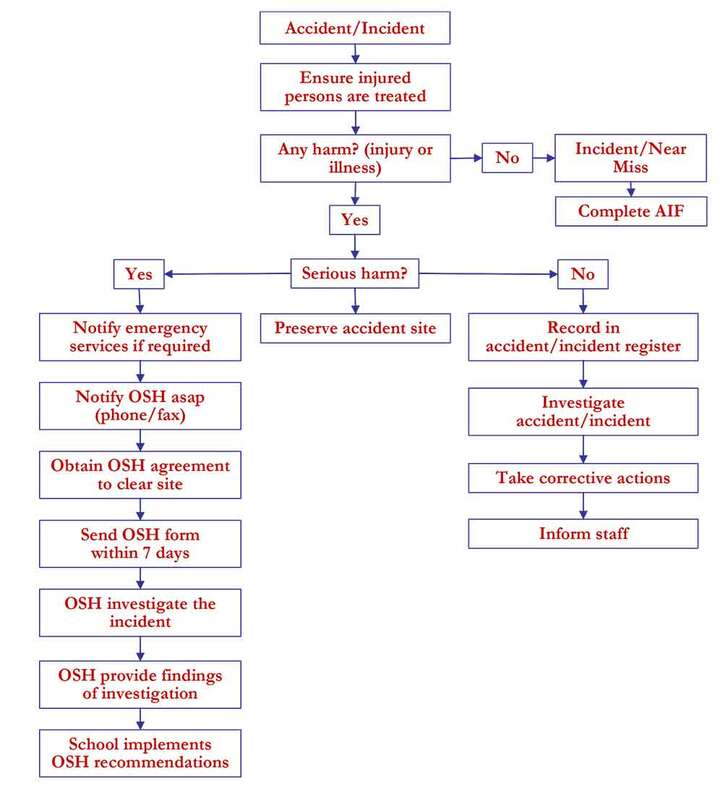 Glenorchy School has a system to record, report, notify and investigate when an injury/incident occurs. This system enables us to identify injury/incident trends and develop injury prevention strategies. 1. Each staff member is responsible for recording injuries and incident reporting when appropriate e.g duty, EOTC activities etc. 2. The school principal, when appropriate, is the nominated staff member to deal with injury/incidents. 3. The school principal in conjunction with St Johns monitors and re stocks first aid supplies. 4. Staff are encouraged to be 1st Aid trained. 5. Follow the above flow chart. 6. Ensure the Principal is informed of any serious incident/injury. ●	Date and time of injury/incident. ●	Part of body affected. 8. The principal will report to the Board serious injuries or incidents. Parents, guardians and whanau will be informed of serious incidents/injury. To provide students with a happy, safe and secure playground environment, ensuring the safe arrival and departure of students, all teachers know what is expected of them, rules are respected and to establish a sense of pride and ownership for the school environment. ●	The Principal or a teacher will be appointed to organise a duty roster at the commencement of each year. ●	The roster will be displayed in the staffroom. ●	Children are to stay seated for the first 15 minutes of lunch to eat. ●	Litter and lost property are expected to be picked up. ●	Lost property is kept in a green wheelie bin outside Principals office. ●	The Principal will be responsible for bus duty. ●	Morning break is from 10.40am – 11.00am. ●	Lunch break is from 12.30pm – 1.30pm. ●	On wet days normal roster still applies. ●	Relievers are to be informed of any duty obligation, either by the Principal or second teacher. ●	Any accidents occurring in the playground are to be dealt with immediately. Injuries are to be recorded in the register in the staffroom and if of a serious nature parents/caregivers to be informed. (Serious eyes or head injury and is behaving out of character an ambulance will be called. ●	Teachers are expected to inform the Principal of any concerns in the playground. ●	Teachers are expected to: be fully conversant with all playground rules relating to the tree line. ●	Tractor/Treeline permission slips will be required. Two people per tree, don’t stand under a tree when someone is in it, don’t pull on others clothing when someone is in a tree, watch for sharp branches when running along, don’t climb more than twice your height. 4. Fence line on Islay Street. This procedure is designed to meet the school’s statutory obligations to maintain a safe learning environment and to consult with the community. As well, the Board is aware of its responsibilities to be a good employer. The overall goal is to maximise the educational benefits of communication technologies while minimising the risks. Use of the Internet and other communication technologies at Glenorchy School is to be limited to educational and personal usage appropriate in the school environment. Appropriate use also includes staff professional development. The communication technologies at Te Horo School are available to staff and students under certain conditions, as outlined in their signed Use Agreements. The school will make basic training available for staff using these technologies. Associated professional development needs will be considered. Appropriate cybersafety measures will be put in place and enforced by the school. In order to ensure the safety of the school learning environment, action should be taken if these safety regulations are breached by students or staff. These cybersafety Guidelines apply to all employees of the Board (i.e. teaching, support and ancillary staff) and to all students. It also applies to teacher and other professional trainees assigned to the school from time to time, relief teachers, and staff and students in the Community Education programme. 1. All students must read and sign a Computing/Cybersafety Use Agreement outlining the regulations and conditions under which computers and communication technologies may be used while at school or in any way which affects the safety of the school learning environment. The agreement must also be signed by a parent/caregiver. 2. Students will be supervised while using technology; the degree and type of that supervision may vary, dependent on the type of technology concerned, where the equipment is physically situated and whether or not the activity is occurring in the classroom. 3. All staff must sign a Cybersafety Use Agreement which includes details of their professional responsibilities and the limits to their own use of the Internet. 4. Educational material on cybersafety will be provided by management to staff and students, and to parents/caregivers. As well, additional safety education will be delivered, where relevant, through teaching programmes. 5. Basic training for staff will be made available by management, as will appropriate professional development. 6. The necessary procedures will be put into place by the school to address cybersafety issues in all venues where the Internet and other communication technologies are accessed by staff or students. 7. The school will provide an effective electronic security system, which is financially practicable. The school will continue to refine methods to improve cybersafety. 10. The school may consult with the wider school community and provide opportunities to learn about cybersafety issues e.g. through Parent Information Evenings. 11. Additional Information can be found on the website http://www.netsafe.org.nz/kits/kits_default.aspx as these are the guidelines Glenorchy School follows.